Ponte Vecchio - FLORENCE LIVE! 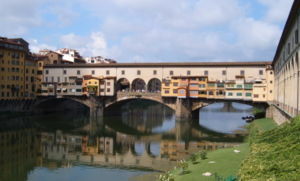 The Ponte Vecchio is a Medieval bridge over the Arno River, in Florence, Italy, noted for having shops (mainly jewellers) built along it. It is Europe's oldest segmental arch bridge. Believed to have been first built in Roman times, it was originally made of wood. After being destroyed by a flood in 1333 it was rebuilt in 1345, this time in stone. Most of the design is attributed to Taddeo Gaddi. The bridge consists of three segmental arches, the main arch has a span of 30 meters (98 feet) the two side arches each span 27 meters (88 feet). The rise of the arches is between 3.5 and 4.4 meters (11½ to 14½ feet), and the rise-to-span 5:1. It has always hosted shops and merchants (legend says this was originally due to a tax exemption), which displayed their goods on tables after authorisation of the Bargello (a sort of a lord mayor, a magistrate and a police authority). It is said that the economic concept of bankruptcy originated here: when a merchant could not pay his debts, the table on which he sold his wares (the "banco") was physically broken ("rotto") by soldiers, and this practice was called "bancorotto" (broken table; possibly it can come from "banca rotta" which means "broken bank"). Not having a table anymore, the merchant was not able to sell anything.